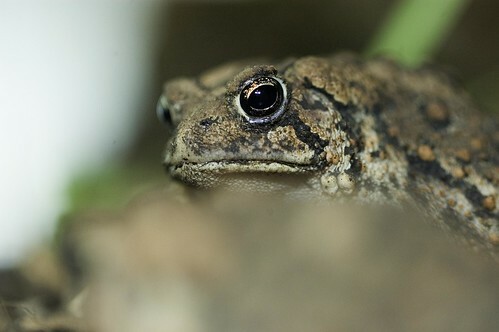 Averaging 3 inches in length, American toads have brownish-gray skin with a white or yellow belly. The skin is covered in warts, and black spots on the back help distinguish the species from other toads. American toads are sexually dimorphic, meaning males and females differ in appearance. Females are larger than males, and females have lighter-colored throats while males' throats are black or brown. This species is found widely throughout the eastern half of the United States and Canada, ranging from Quebec to Alabama. 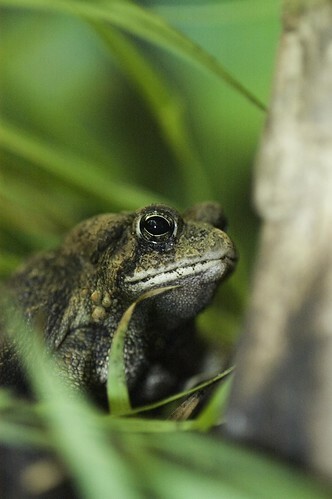 American toads are common in their range. 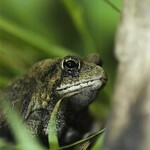 American toads occupy a wide range of habitats, including forests, farms and even backyards. Eggs and tadpoles require freshwater ponds and pools in which to grow. Tadpoles feed on aquatic algae, and adults use their long, sticky tongues to snare insect prey. The species is nocturnal and spends much of the day hiding under rocks, logs and leaves. 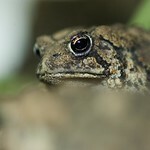 American toads are most active during warm weather; in cold climates, they will hibernate through winter in burrows. American toads are solitary, coming together to breed. Males establish territories near ponds and attract mates with long, frequent calls. Breeding occurs with the male gripping the female tightly and fertilizing her eggs as she releases them into the water. Tadpoles hatch within 3–12 days, spending 40–70 days in the water before transforming into adults and moving to land. American toads defend themselves against predators, such as snakes, by excreting a toxic, milky substance from the skin. They will also urinate on themselves if threatened. As a last resort, the toads can inflate their bodies to prevent being swallowed. American toads periodically shed their skin as they grow. The old skin is gathered at the mouth as it sheds and is swallowed to retain nutrients!